What Is IVR: Is Your Company Optimizing the Customer Experience? Consumers expect an immediate response from companies, and they expect their interaction with your company to be fast, easy, and convenient. Interactive voice response (IVR) is the tool many companies use to meet this expectation, providing a streamlined process for customers to resolve problems, ask questions, and gather information. What is IVR? IVR technology has been around for decades; it’s simply any phone system designed to funnel calls through an automated process. It began with a simple “Press 1 for customer service, 2 for billing,” type of instruction, but has progressed to a more complex, user-friendly tool that still serves the same purpose as the original IVR. And even though it was designed to route calls in the beginning, now it can be used to distribute information, resolve an issue, place phone orders, or pay a bill on the phone. While its demise has been predicted many times in the past, IVR has instead gotten more intelligent and agile, continuing to serve businesses both in terms of cost savings and satisfied customers. Customer satisfaction: With IVR, the customer is able to access information 24 hours a day, seven days a week, 365 days a year. They are likely to spend less time on the phone with an automated system than they would with a live agent. In addition, the company can tap into powerful analytics that help them understand customer preferences, log customer complaints, and gather critical data demonstrating patterns in service issues or resolution times. Cost savings: Employing agents to solve routine problems can be costly, and IVR removes much of the tedious work from customer service agents, allowing them to focus on more complex problems. Cloud IVR solutions eliminate the cost of hardware or upgrades, capturing all the cost of the communication system in a monthly subscription. Companies also find that the time required of their IT team is decreased because all troubleshooting and maintenance is handled by the provider. Flexibility and agility: Cloud IVR has the capability to allow your company to integrate the technology with other cloud solutions. This allows your voice applications to access real-time data and can further equip the IVR to expand its options, such as allowing customers to pay their invoices during a telephone call. 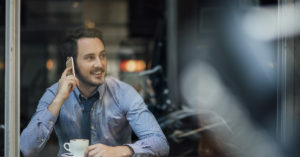 How to use IVR: IVR is typically associated with bigger companies, but even a small business can use IVR for a variety of services. Some companies utilize IVR when it’s time to conduct a survey or poll for their customers. Caller-customized prompts: Some IVR systems have a feature that allows for the creation of specific prompts once the system has recognized the caller’s phone number. This means that if a customer has previously called about an invoicing problem, IVR can initiate a prompt that asks if the problem was resolved to their satisfaction. Pre-recorded messaging: If a company is offering a sale or promotion, or if there is immediate or emergency information that needs to be communicated, a pre-recorded message fills this need. A message can also be nice, simply because it sounds more natural than a virtual agent voice, and can be an appropriate solution for wishing customers happy holidays or welcoming them to a new IVR system. Handling high call volume: During a promotion or during the holiday season, in retail industries, IVR can help companies manage the high volume of calls coming in, ensuring that every call is answered. And cloud IVR solutions are capable of “bursting” or automatic expansion when a higher number of lines is necessary. Correctly routing calls: When IVR is able to accurately route calls to the appropriate department, customers experience faster resolution of the issue that prompted the call. This boosts overall customer satisfaction. Alternatively, being pushed around from one department to another, without any satisfactory resolution, can often mean the end of a customer relationship. Moving forward: In the upcoming months, IVR will improve further with an increasing focus on integrating artificial intelligence, like machine learning, that allows the system to better answer customer questions and respond to customer behaviors. They’ll begin to understand what’s implied by certain questions, instead of just answering the question on its face. If you’d like to explore further the specific benefits that IVR might have for your business, contact us at TelcoAlert. From the first step of identifying your business needs to leveraging the right technology for your business, we can walk you through each phase of the process.